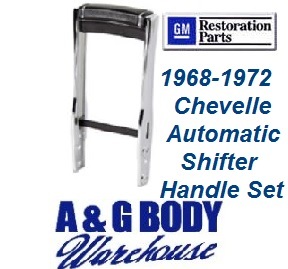 For your 1968 1969 1970 1971 1972 Chevelle models with center console. Beautiful chrome plated diecast reproduction of the original horseshoe automatic floor shifter handle. Includes correct grained black handle cover with silver Mylar accent bands and accurate reproduction in stainless of the inner pull-up mechanism assembly. Fits 1968 1969 1970 1971 1972 Chevelle models with automatic console and horseshoe style shifter. 1978 - 1985 Dash Cap Cutlass Many Colors Available!